Hi there! I have a card to share that I made for Breast Cancer Awareness Month. 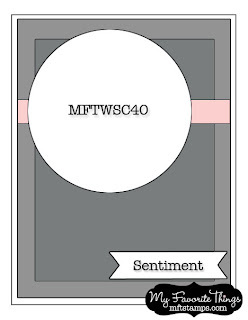 Today I'm using MFT's new set, Who's That Girl Chooses Hope. I also used the latest MFT Wednesday Sketch Challenge #40 for my layout. This set has 2 great images, one of WTG alone (the one I used above) and another with WTG and a friend. Love them both! I used a few different designs from the Authentique Uncommon paper collection on my card. I pieced her shirt and matted her onto the Die-namics First Place Award Ribbon. I then popped this on top of a rosette that I made using the Die-namics 3/8" Rosette Die. 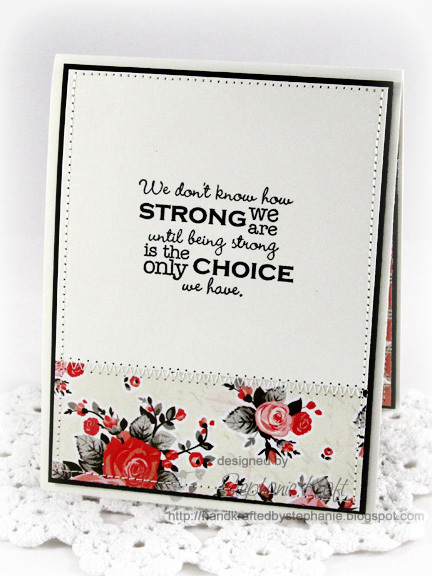 My sentiment is from the mini set that was sold only with the Who's That Girl Chooses Hope VIP collection (no longer available). I also stamped the larger of the two ribbon images next to my sentiment. The sentiment was cut out using the Die-namics First Place Award Ribbon as well. Accessories: Die-namics First Place Award Ribbon, Die-namics 3/8" Rosette Die (My Favorite Things), Dyed seam binding, Foam tape, Thread, Sewing machine. Wow, this is such a gorgeous card. Absolutely perfect for Breast Cancer Awareness Month! Gorgeous card, Stephanie!!! Love the colors and that great rosette! Beautiful card Stephanie! Love the paper pieced polka do shirt and wonderful sentiment! Your rosette looks fab! Thanks for the inspiration! Beautiful card for an amazing cause. I love the inside of your card too.